Five years have passed since the blockheads of Bricksburb saved the world and gave everyone an infectious earworm to the tune of “Everything is Awesome” in ‘The Lego Movie.’ Now in ‘Lego Movie 2: The Second Part,’ the citizens find themselves in a similar battle to defend their town from being destroyed – this time by invaders from outer space: LEGO DUPLO. In an effort to defeat the aliens and restore peace to their home, Lucy (Elizabeth Banks), Batman (Will Arnett), Emmet (Chris Pratt) and others embark on an adventure into unexplored territory. On this journey, the group find themselves stuck in a bizarre galaxy where music is all-consuming, and their bravery and building skills will be put to the ultimate test. Although the sequel is not as charming as the original, it still captures the oddball humor that Phil Lord and Chris Miller are known for. Adults will appreciate the wild array of bizarre jokes – especially from the Lead LEGO: Batman. There’s everything from how he “hides his troubled past in his chiseled physique” to referencing his future movies that are “in future stages of development.” The sharp comedy is really what keeps this franchise afloat and there is no shortage of laugh-out-loud moments. The dazzling kaleidoscope of graphics that are used alongside real LEGO blocks is fun to watch too. The unique visual style just adds a whole new level of inventive storytelling that doesn’t come along very often. 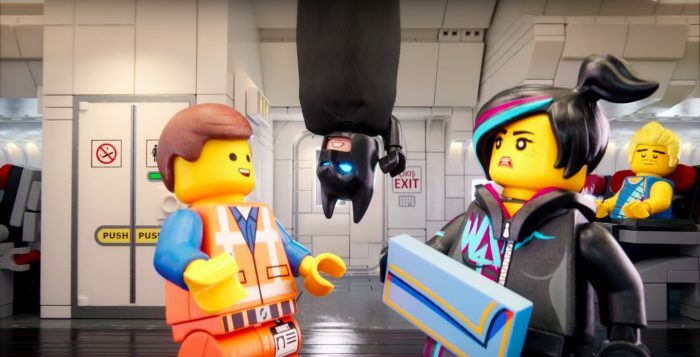 The only problem with ‘Lego Movie 2: The Second Part’ might be the slight staleness of plot and sensory-overload that make it difficult to digest at times, but it’s still quality family entertainment with an edge. In such a cash-in industry, it’s a breath of fresh air to see such creativity. And where else can you find a clumsy, google-eyed banana, pool-playing raptors, stars that vomit rainbows, sewer babies and an unexpected cameo from Bruce Willis? This entry was posted on Thursday, February 7th, 2019 at 1:26 am	and is filed under Film, News. You can follow any responses to this entry through the RSS 2.0 feed. You can skip to the end and leave a response. Pinging is currently not allowed. « The Prodigy: Film Review!